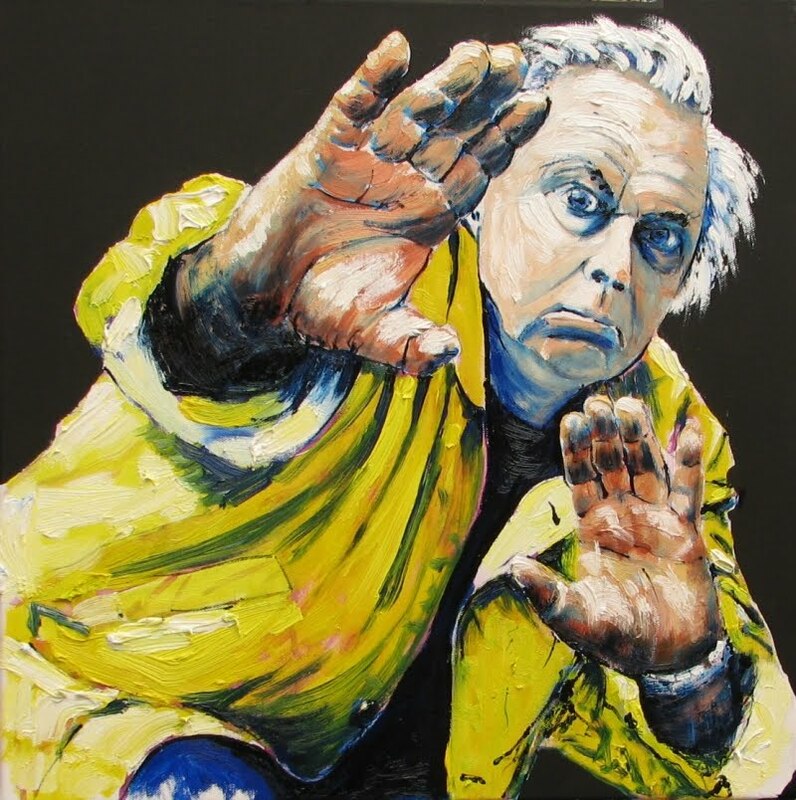 Update: OK, here is the coloured version, just finished (1.00pm Sunday 23rd), sporting my yellow painting jacket. I've now popped the exploratory sketch that was here down at the end of this post. Thank you everybody for the wonderful comments you have left. They are what makes this blog so rich and rewarding for me. well, i just got back from a few days in melbourne (have posted some pics in my photo blog the crystal cornea) and dying to get back out into the studio to continue work on my latest. The very day i left i was working on this preliminary sketch in charcoal and acrylic. the theme continues to be the emotions around aging, around growing old, about the loss of physical and mental powers, the loss of social status, the increasing incidence of serious illness, the ever increasing likelihood of death. Although these are self-portraits, this work is not actually about me. 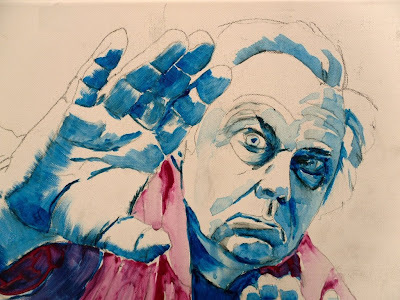 As i explained at the very start of this blog, i am using self-portraiture chiefly because the model is always available, will do whatever i ask of him, and won't complain about how bad i make him look. Yes i draw on my own emotions to fuel the energy of my brush, but this work is not 'confessional'. I am not simply indulging myself in some solipsistic fugue. Rather, i am trying to make more universalistic statements. This Masters project is as much sociological commentary as it is psychological exploration - or will increasingly become so over the coming year. I am trying to articulate states of feeling that many people know but can't own up to because society maintains a conspiracy of silence about them. We shunt the old and terminally ill into institutions - out of sight, out of mind - while we young ones get on with making and spending money as if getting and spending could never come to end, or could ever be an end in itself. i had been exploring feelings of horror and terror at the realization of mortality, not simply the intellectual acknowledgement of one's own mortality, but the feeling deep in one's bones, one's gut, that one, me, you, will cease to be. I am now trying to move on from that to other feelings. And the one i am working on now is stoic defiance. Keep away disease. Keep away death. The finger in the dyke. Except i'm too old to trust in failing dykes. 'Confessional', Harry. There's that word again. I like your take on the reasons for self portraiture, that the artist won't complain about his own interpretation of the portrait. Powerful painting here, Harry. Thanks. Glad to see you back here. I hope you had a pleasant journey. Yes, the themes you are expressing are universal to us all. I can relate to the "creeping in" feeling that you speak of. It started when I hit the 40 mark. I don't see it as a start of decline, only the beginning of things much greater. There word is deliberately chosen in the light of the recent discussion in your blog, Elizabeth. Indeed, that discussion put me in mind to write the disclaimer. Whether the disclaimer is true or not is another matter. I mean, my whole staring premise is the Renaissance statement "Every painter paints himself". These paintings would be profoundly personal even if they weren't self-portraits. It is interesting to ponder the similarities and differences between autobiography and self-portraiture. Historically the reasons why self-portraits were painted include some that might not appear in a similar survey of the history of autobiography. There are many reasons why self-portraits were painted (see http://userpages.umbc.edu/~ivy/selfportrait/intro.html). But among them is the 'permission' to explore and represent the sitter with great licence and little immediate repercussion. Leaving aside portraits painted as politico-social polemic (eg, caricature), self-portraiture allows much greater possibility for blatant honesty in depiction or of heightening character flaws or representing socially sanctioned inner states. It may have been a throw-away line, but it surely contained a germ of experience when John Singer Sargent quipped, "Every time I paint a portrait, I lose a friend". Hi Manel, thanks for your thoughts. I agree, there are gains in aging. Less acne, for one. Maybe an improved capacity to see 'the big picture' instead of sweating the small stuff is another. But at this stage, my aim is to explore emotional concomitants of the progressive loss of function that come with aging and to audit the pre-grieving over one's own demise. So i'm curious to paint around any of the Kubler-Ross stages, other than denial. Thanks for the welcome back, amigo. I'm amazed by that last quote from Singer Sargent - "Every time I paint a portrait, I lose a friend". It suggests to me that the same issue exists in art as in literature. People cannot bear seeing themselves through other people's eyes. It's as if we have an internal view of ourselves and when someone else describes us whether through words or in paint the image does not fit our self -perception and we can feel shattered. Some then go off and shoot the messenger. It's sad. If only we could be more accepting of other perspectives. Thanks for your comment , Harry, I find these ideas fascinating. I once tried a written self portrait on my blog. It was an interesting experience. All the time I kept trying to give myself 'permission' to speak honestly, but I mainly described the abstract personality qualities, far less the physical. I might try that one day. Don't worry, Elizabeth, Sargent painted such sumptuous flattering affairs that i can't imagine anyone being alienated by them. Francis Bacon's Cecil Beaton is another matter. I am glad you mentioned autobiography and portraiture as performance in your blog. It touches on my post back in April about sitter performance, persona selection, self-image projection, transactional understandings of the sitter-painter diad, which all suggest more complex things are transpiring than a simple sketching of 3D form (eg Kozloff, M., 1995, ‘Portraiture and performance’ in Face Value: American Portraits. Donna De Salvo). However it is your point about the parents being the first audience to performance that struck a chord. And upon reflection, explains a lot. So thank you. Cognitive psychology uses the metaphor of scripts to describe culturally acquired ready-made patterns of behaviour that accompany social roles. Theorists like Orville Brim have suggested that our very sense of self is really a script we play in our heads as a self-reference - self as learnt narrative. The inference is that there is no 'core', no Jungian Self, just layers of onion, narrative inside narrative, Russian dolls made of reflexive head-talk, of illusion. "Now art our revels ended ... ". Hence the cognitive dissonance when confronted by an image of self that differs from the one already in place (self-attribution). Which was why, in my April post on mirrors and the self, i cited the passage re the rejection of photos of the self in the early days of photography. What would happen if you wrote your self-portrait and posted it in your blog but attributed to some fictive person. How would the meaning of reader reaction change? What sense of ownership would you feel of those reactions? How much of autobiography is made up of identification with narrative, even introjection of the narrative, rather than the idiosyncratic content of narrative per se? Yes, the whole field is fascinating. Hola Harry, me resulta muy divertido e ingenioso el cambio de imágen en tu avatar, aparte de ser expresivos. ha ha, gracias Paqui. Pensé que un cambio de cara podría ser divertido. Éste es sólo un boceto para la pintura real Ahora estoy trabajando. Gracias por venir. What a great post Harry. It's really heartfelt. I always lauhed a bit as people were concerned about aging, getting older. That would never happen to me i thought. But turning 50 and more it hit me unexpectedly. So i understand feelings of horror and terror very well. Working in a carecenter with people over 80 who are ill helps (strange maybe but it does)It keeps me humble and grateful, and lauging also, to stick out a tongue to death. Your painting is really awesome, a strong image; intense eyes, i read a lot of feelings in his face. Behind the stoic defiance i also see the fear and some sorrow. Because of his mouth. What i love most about aging (but hate it at the same time) is the melancholy. I never knwe the meaning of this word before. Have a great weekend Harry! Your work as a carer affords you special insights, Momo. Yes, laughter is perhaps our best refuge and only revenge against the Grim Reaper. And maybe, trying to 'contain' him in art. Interesting what you say about melancholy. The busy medical world is ever ready to medicate if we aren't all satisfied consumers living the dream (and of course, profound clinical depression requires medication). But i believe melancholy, especially that acquired from years of life experience, can also be a form of sensitization, a way of knowing. Or at least, a concomitant to knowing. As the book of Ecclesiastes has it, "With much wisdom cometh much sorrow". in which case it would be as inappropriate to sedate it out of existence as it would be for a color-blind populace to force dark sunglasses on any citizens who claim to see in color. Hi,Harry, thanks for you comment on my latest drawing. I like this post and will spend some more time going backwards on it, to see more of your work. Since I just turned 60 last week, this subject of your exploration is of particular interest. So far I am in good health but the realization of what may lie ahead and the fact that someday I may not exist seems to pop up more frequently. There is however, some curiosity about what it will be like. Not morbid, though. Anyway, I think it is interesting that you are exploring it all through the self portrait. This one is dynamic and so intense and expressive. Beautifully rendered. I popped over to your blog because I saw your avatar and I was intrigued.... and then I saw this self portrait..
WOW... This is so powerful!! Most of the self portraits I've seen have been so static... this is amazing..
thanks for your generous comments, Cathyann. Happy Birthday for last week! I read in the research that our 60's are meant to be a more settled time of life, despite moving into retirement. Or maybe because of it. While for many their 50's turn out to be a second adolescent, with identity being questioned and once again up for grabs, and the last possibilities of crowning success in careers or new careers slipping through fingers fast. I'm not sure how valid those findings still are in these 'post-modern' times, but i do relate to your curiosity about final days and what lies beyond. Entering old age is not all dread and horror, or anger and frustration, or bitter resignation. There can be settled stillness, philosophical acceptance, or just plain weariness with the weary round. Father Time now flashes past (must be in one of the Toyotas with the stuck accelerator). Not ANOTHER spring! Food is less tasty and newsprint is blurry, but for that, pain is less painful. Sometimes when we think those in advanced old age are depressed (they don't seem to want come for their nice Sunday ride in the country! ), it may simply be because the loss of interest isn't pathological but symptomatic of a natural withdrawal of cathexis from this life. As the old Animals song has it, they've got "one foot on the platform, the other foot on the train". Wherever our journeys take us, thank you for journeying past here. May the reamainder of the our tripping be filled with creativity and meaning, wherever our respective roads lead. hi Marian. I'm glad you popped over. Thanks for enthusiastic interest in my work. It's uplifting to read. Welcome back any time. more and more i get impressed with your work . not just the work as itself , but the hability to make things happen is a pretty and exiting was . i believe that moviment is always a strong characteristic of your work . even when you do "static " portraits . I find very interesting your thoughts about the topic that you want to capture in your paintings: aging, loss of physical and mental faculties ... indeed nobody seems or wants to accept that all of we have an old person in us. About portraits, how are true your words! Who better that oneself to experience? I have sometimes used friends or relatives, requiring from theim and appealing to their sense of humor to 'making faces' It comes to my mind one story: I read once that when Velazquez painted Innocent X's portrait, a superb job, the Pope said 'Too much real!' (Troppo vero). Harry, your work is magnificent. I look forward to the next job. What a riveting painting, it says everything that you have described so succinctly in your blog. This ageing thing - coming to terms with it, inevitable process as each milestone hurdles towards us. My big 60 this year too. And it's so true how time just seems to pass quicker than ever. What a great title 'Defiance' as you try to hold back the years - as well as all those other dreads we associate with old age. A fantastic self portrait in which I see myself too. Thanks, Caio. It's good to know someone is getting more and more impressed rather than more and more depresssed by my work, ha ha. I look forward to seeing what youre painting at the moment. I love your self-portaits in your book. Your exploratory brush, like a mantis antenna feeling its way round the face till it gets to the eyes, then - POUNCE! So what is that brush doing now, i wonder. Saludo, Lozzano, and thank you for your thoughts. Yes, we must have had an old person in us from the very beginning, for my cells seem to know just what to do, and when to do it, to turn me into a bald wrinkled old fool! Old age seems programmed into my genes. If chance allows one to get there. Is a short life of glory better? To die in battle like a Viking, or in the ring as a matador? And yet it has always felt the other way around. I am the eternal child. All that happened was that i had to learn the politcs of the school playground to survive in adult society, for that is how nations function. I fear adulthood is over-rated. I look in the mirror and see a little boy staring back in disbelief. I am become Dorian Grey except my portrait remains pristine, frozen within the glass. It is this flesh that is mutating. You are braver than i, Lozzano. I have not dared ask anyone to pose. 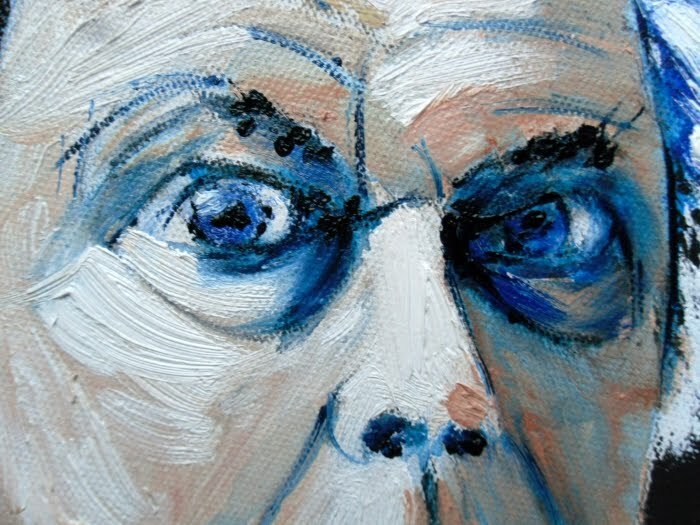 Later this year, certainly by next year, i will painting portraits of others, not just myself. And what a challenege Velazquez has given us, Troppo vero. hi Carolann. Thanks for stopping by. You know, the big 60 is not so big. Don't let it bully you. It comes and it goes like every other year. And our lives aren't really made of years, i don't think. Years can be just the long prairies we ride across as we journey. It is the few intense moments scattered here and there, like a fresh spring or a sudden ambush, that give us our most intense memories and mark our turning-points. As for the speed at which time seems to pass, it is causually connected to the rate at which a cut finger heals, both the product of slowing body chemistry. As banal as that. At least cocktail parties are over before we know it and we are soon home again tucked up with a hottie (water bottle, that is). Ya gotta larff. Thanks for your warm and generous response to my post. Cheers. The painting is growing strongly. I'm eager to see how it will look like at the end. I'm not sure i'll be doing much more to it, Manel. I hate the thought of over-working and so would sooner leave things a little raw than flogged to death. And i get so many ideas. Already i have started on another one, black coat, white chair, where i'm looking for drama from the composition rather than the facial expression. I'm delighted to see your painting is going so well at the moment. Take care. thanks Sam for coming by and taking the trouble to search out something of interest. My work is quite different from your own meticulously finished studies but we both share a love of painting and portraiture. And i so love the gentle humour and affection in your lovely ladies of the fields. que bueno q esta este! i love how you did the hands.. very cool. Simone de Beauvoir escreveu uma obra colossal sobre a velhice para romper o silêncio que envolvia esta fase da vida. Segundo ela, a sociedade de consumo trata os idosos como párias, condenando-os à miséria, à solidão e ao desespero. "Antes de tudo, exige-se deles a serenidade; afirma-se que possuem essa serenidade, o que autoriza o desinteresse por sua infelicidade", escreve Simone na introdução de seu ensaio. Assim como a feminilidade é socialmente construída, Beauvoir afirma que a velhice é acima de tudo um fator cultural. Hola Paulo. Muchas gracias por su lectura y su pensamiento profundo en mi tema. Su cita de Simone de Beauvoir es muy apropiado. Estoy totalmente de acuerdo, la vejez es una construcción social como de género y raza. Y las personas mayores pueden convertirse en víctimas de la discriminación y el apartheid prácticas similares. Yo trato de expresar mis sentimientos honestos acerca de estas cuestiones en mi arte. Y para hacer un grito personal del corazón de mi propio enfoque hacia la vejez. Gracias por sus comentarios muy favorables. Espero que tu fin de semana es buena. Yes, exactly Harry, i so agree with you about the melancholy. Because this feeling brings acceptance and joy as well i think. It is sad to sedate it with medicins. Because melancholy isn't depression. I guess you see quite a bit of what i'm talking about in your care of your 80 year olds, so i value your opinion, Momo. And yes, i agree. Melancholy is not simply a clinical entity. Sometimes it is part of a philosophical musing on life and its meaning, which in turn becomes acceptance or resignation, an adjustment to the realities of one's life. Once can be wise, productive, positive - and melancholy. as I failed to see it? wow, this work is awesome! hi Denise, thanks for for having a look. Yes, there is just so much to see, so many talented people, like yourself, so much art appearing every day, and we want to see it all but end up missing some in the rush. But at least we manage to catch up. Ciao. i do like everything on this one . the way the atmosthere happens by the colors you use on the main figure !! Thanks Caio. I put an undercoat of Alizarin under the lemon yellow and allowed it to peek through, hoping the purple against the yellow would give off a billious feel. So all to the people out there who find this art revolting, you have fallen into my trap, ha ha haaaa. Very fun! interesting profile. I'm finally jumping into art after ignoring it for so long or keeping it in my head. Got distracted by the New World Order and all that stuff that nobody wants to talk about. Welcome to my blog, anon. As for art? don't just think it - feel it. Don't just feel it - do it! haha.